This blog talks usually about books and reading, and sometimes about Ghanaian libraries and librarians, and information relating to the first two overall topics. It is interesting that at the moment both the President and Vice-President of Ghana have close ties with books and libraries, though in different ways. I have mentioned before that John Dramani Mahama (now President of Ghana) wrote a memoir, My first coup d’etat and other stories, which was published early in July 2012. As Vice-President he undertook a mini-book tour in the US during which the book was formally launched. I haven’t read it yet, though I look forward to doing so. So a writer, an author as head of state – which Ghana has not had since Kwame Nkrumah and Prof K A Busia. The connection with the now Vice President of Ghana – Kwesi Bekoe Amissah-Arthur – is a slightly indirect one, but there is a close family connection with libraries, in that his wife has been a practising librarian and continues to be involved in various aspects of the profession through consultancies and her key role in the Ghana Library Association‘s celebrations of its 50th anniversary. Whether these involvements will have any impact on either the books or libraries sector is of course another matter, but one can hope! Two literary events during this past week, and they took place back to back – on the 18th and 19th of January. The first I have known about for quite some time, as it involved a senior colleague at work. The second was totally unexpected – and I literally had less than three hours notice [admittedly partly my fault]! The first was a book launch, the second wetted my appetite for a forthcoming work. Again the first was fairly formal – with speakers on a podium and a high table, while the other was outside, around an alluring blue swimming pool which pulled my thoughts towards a dip, even if it was only my feet! The first was academic though impinging on policy and the Chairman did not mince words; the second was supposedly non-political – at least in the contemporary sense – though the readings from the forthcoming book written by the Vice-President of Ghana referred more to the politics of the 1970s, while blended in with recollections of growing up in the northern town of Tamale. And as I write, I realise that both books have children on their covers! 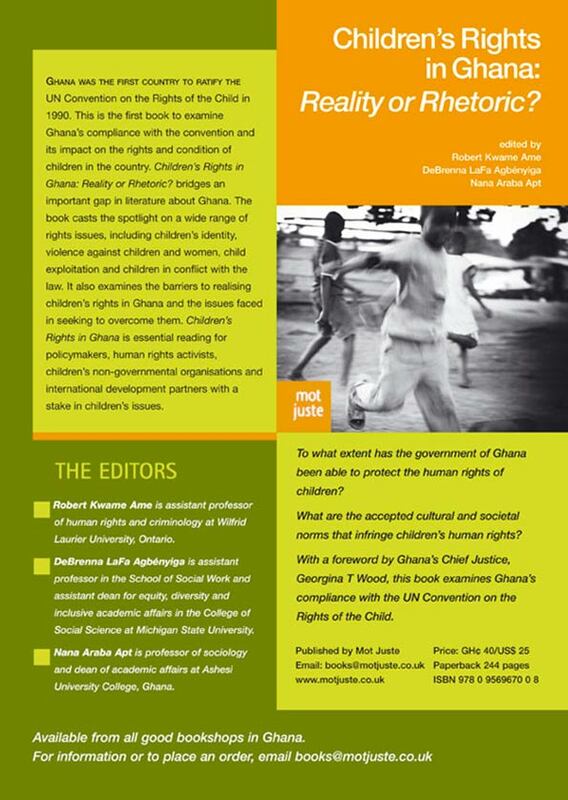 The first book, Children’s rights in Ghana: reality or rhetoric, is edited by three academics, one of whom, Nana Apt is Dean of Academics at Ashesi University College where I work. I had already seen a hard copy version of the book, which was published in the US. This was a paperback edition, specifically meant for the Ghanaian market published by a UK based company called Mot Juste. I have to admit I was especially impressed by the Chairman, Ken Attafuah, who did not hesitate to be straightforward, yet picked up some of the essentials of each person who played a role in the event. The second event was readings by various well-known Ghanaian writers, in honour of Bloomsbury (USA) senior editor, Nancy Miller, who was in Ghana for a brief visit, working with the Vice-President of Ghana who is publishing his memoirs – My first coup d’etat and other true stories from the lost decades of Africa. Several of the readings were amusing – mainly for their descriptions of events which many of us know or have experienced. The highlight was of course quite a long reading by John Dramani Mahama of an excerpt from his forthcoming book – he chose a tale of first teenage love interspersed with how the Acheampong regime impinged on his own family. A couple of colleagues have written about the event, including Nana Awere Damoah who was also present (see his blog with the same content on Facebook.) Nana Fredua-Agyeman also commented on writing by heads of state and its relative scarcity here in Ghana. I safely say that many of us are very much looking forward to Mahama’s book actually arriving here in Ghana.